When someone mentions ranch, it conjures up images of the West. That is only if you are unfamiliar with Dr. H.B. “Woody” Bartlett ’64. Dr. Bartlett is hands-on with veterinary students. c concepts about equine breeding and bloodlines. Dr. Bartlett is old-school, and proud of it, straying from a highly mechanized way of ranching and relying on a purist form, one that comes from his soul. It is with that passion that he generously teaches others, including students at the College of Veterinary Medicine. Each February, students led by Dr. Reid Hanson, a professor of equine surgery, spend a full day at the Flying “B” Ranch, where they receive hands-on instruction from Dr. Bartlett and Dr. Hanson, castrating weanlings to eventually be sold as ranch horses. 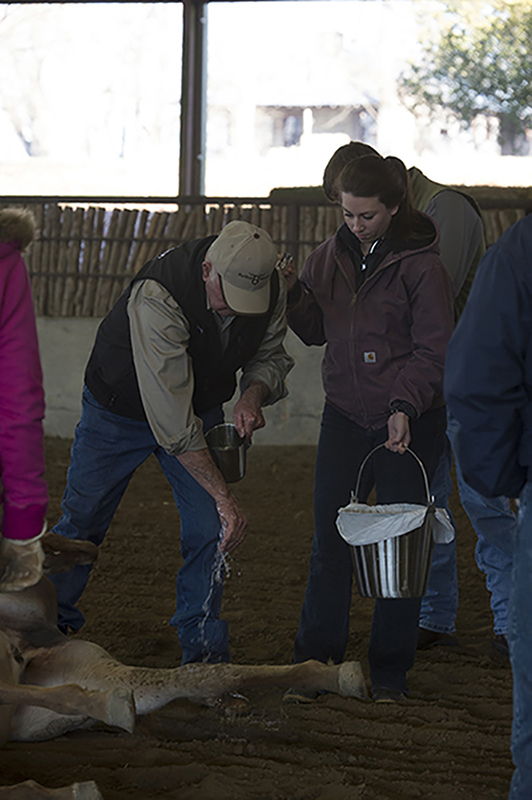 For more than 20 years, students have had the opportunity to learn from Dr. Bartlett and his ranch hands about the industry, a valuable and unique educational experience. “This experience at the ranch puts our students in a real field situation, which represents a much different opportunity from the clinical environment of the teaching hospital,” Hanson says. It is Dr. Bartlett’s career experiences, love of horses and ranch operation knowledge that he passes along to Auburn veterinary medicine students. And, they love it. Dr. Bartlett and Pat Dye. burn, not long after the legendary coach had retired from the coaching arena. “This is a wonderful thing he does for Auburn veterinary students,” Dye said. “It’s an opportunity for students to get practical working experience. Dr. Bartlett runs his cattle operation primarily using his own horses. “I think that’s one hallmark of a lasting performance ranch horse producer,” he said. “I mean, what better way to demonstrate your horses are the kind of quality we tout than by using them for multiple tasks on the ranch every day. Dr. Bartlett’s vision of producing top-quality American Quarter Horses was born out of several influences, not the least of which was his father, a physician who supplied his hospital with fresh meat and produce from his farm. The elder Dr. Bartlett wanted his son to follow in his footsteps as a human doctor, but the son persisted in his desire to become a veterinarian with a talent for recognizing and breeding performance quarter horses that are both versatile and consistent. 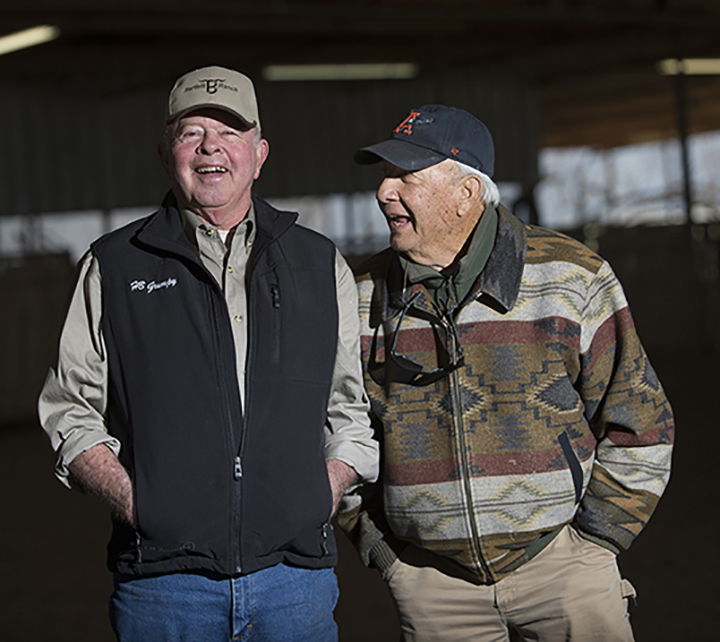 The cattle production has remained a component of ranch operations, but Dr. Bartlett’s passion for breeding American Quarter Horses has remained the focus throughout the years. The Alabama ranch typically breeds around 80 mares annually through a combination of artificial insemination and pasture breeding. He continues to refine the ranch’s horse breeding with an eye toward ranch horses and premier cutting horses, from the start working to raise well-bred, eye-appealing horses. 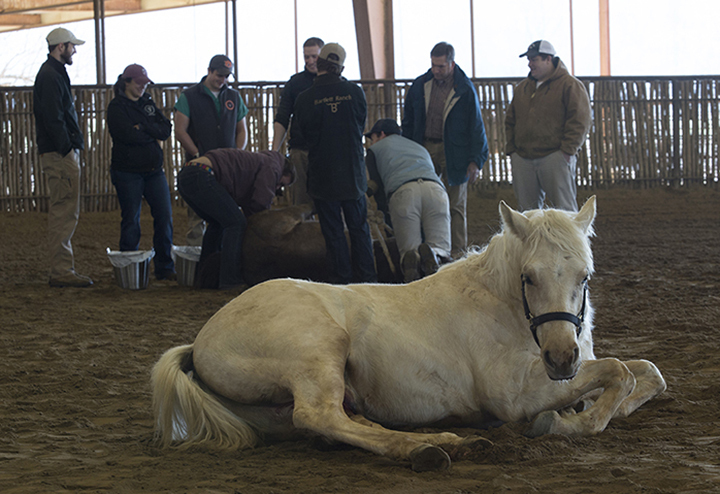 Auburn veterinary students, faculty and Bartlett ranch hands tend to a horse. As a result, Bartlett Ranch Wyoming runs about 3,000 head, mostly steers, purchasing 2,000 to 2,500 each fall that spend the winter with home-raised cattle. He grazes them through the summer before sending them to feedlots. “I’ve gradually worked into a cow herd, and run 850 to 1,000 cows now, all blacks and all Angus bulls,” Dr. Bartlett says. “And we’re raising some roping steers on a few Longhorn cows.” The Longhorn cattle add another facet that complements the ranch’s horse program, providing an avenue for horses to develop into solid rope horses. And that, in turn, serves the cattle program.